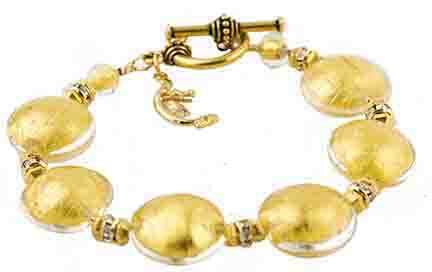 Classic Crystal and 24kt Gold Foil lentil (a disc shape slightly puffy in the middle) is authentic Murano Glass Jewelry. 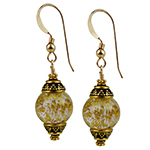 The approximately 18mm encased 24kt gold foil lampwork Murano Glass beads are spaced with gold plated beads and crystal rondells. The clasp is gold plated and features our signature Venetian gondola charm. For accurate sizine, click here for ruler and put your size in the comments section at checkout.